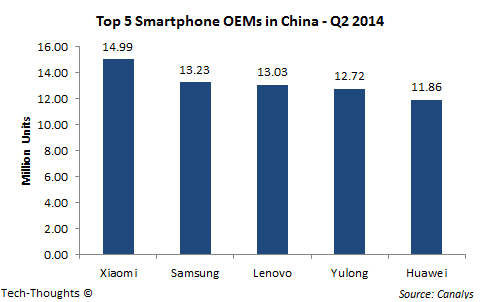 Canalys just reported that Xiaomi became China's largest smartphone maker by shipping 14.99 million units in Q2 2014. This data point is interesting for two reasons -- the first deals with their success in China, and the second deals with the state of their international expansion. First, it is an incredible accomplishment for a relative newcomer like Xiaomi to overthrow behemoths like Samsung and Lenovo in the world's largest smartphone market. It is even more impressive that Xiaomi was able to accomplish this feat in the quarter leading up to their product refresh cycle. With July's Mi-4 launch and subsequent product refreshes due later in the year, Xiaomi's sales should accelerate. Also, Kantar's recent survey showed that 8% of Apple customers and 12% of Samsung customers planned to switch to Xiaomi when they upgrade. Overall, Xiaomi seems to be in very good shape in China. Second, taking into account the company's previous announcements, Xiaomi sold a total of 15.1 million units in Q2 2014. This means that their international sales totaled just ~100,000 units for the quarter. The obvious question to ask here is if this disparity was driven by demand or supply. As of now, we don't have a firm answer, but we can look at their recent launch in India for clues. Xiaomi saw more than 100,000 pre-registrations but had only 10,000 units available for sale in India. While pre-registrations may not necessarily reflect true demand, the disparity between those figures suggests a significant demand-supply mismatch. This is both good and bad. The good news is that Xiaomi seems to have far more room for growth. The bad news is that Xiaomi could also lose immediate sales to "high quality-low price" competitors like Motorola.